Due to complexities beyond their control, many firearms website owners cannot easily figure out, among other things, basic items like where to get started when trying to find a payment gateway and credit card processing system that works with their industry and shopping cart. If that sounds like you, this article can help. Are you interested in becoming a web-based FFL dealer? Online FFL e-commerce is considered a prohibited category by many software companies, payment gateways, and merchant account providers due to the higher degree of perceived risk or regulatory hassle entailed. The “out of the box” payment processing used on most website builders is designed for standard e-commerce and does not support FFL dealers, but we can help. Because of all the challenges that FFL dealers who provide the vital service of performing federal background checks have, FFL to FFL online firearm sales is one of the most common high-risk industries we offer advice on. But first, why become an online FFL in the first place? To make money, and to serve a community you care about, right? This is an industry where you must be diligent and attentive to the laws and credit card processing rules that govern firearm sales and distribution. An online Federal Firearm Licensee store can certainly be a profitable way to do business, but there is also a degree of risk involved. On the one hand, there are the laws to know and abide by, on the other you need to stay knowledgeable and safe in today’s e-commerce world. As an FFL you are likely familiar with the laws and regulations of your industry. However, having an in-depth knowledge of the nuances of credit card processing and payment gateways might be new to you. This is why we are happy to help you and your company with payment gateways, chargeback mitigation, data security, and credit card processing recommendations. New to FFL and ammunition e-commerce? If you are just getting started, or are interested in getting involved with online FFL to FFL sales, take a look at the AFT’s official site. There you’ll find a lot of information regarding firearm sales and regulations. It’s important to know everything you can when you are involved in or plan to engage with, a delicate and highly regulated industry. If you’re new to this or just started entertaining the idea, let’s start with the basics. What type of FFL do you need? 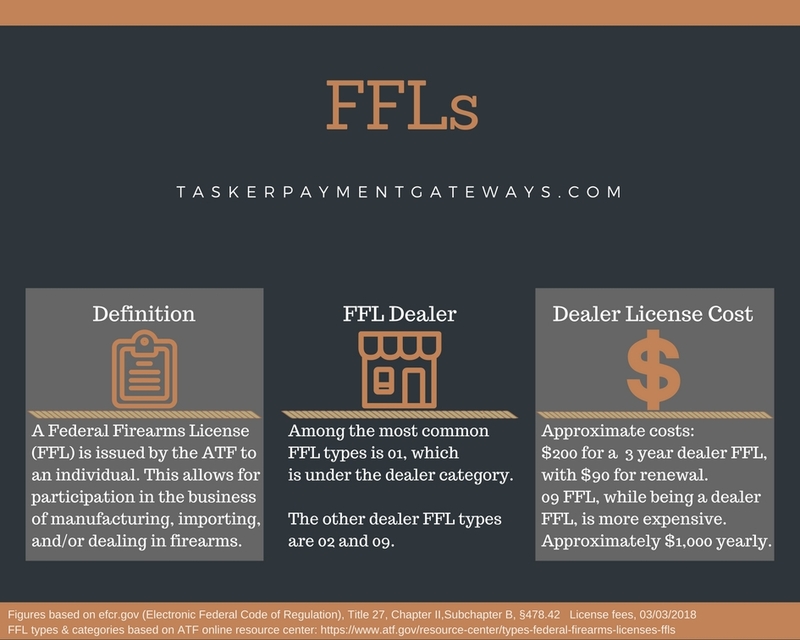 The ATF has provided an excellent overview of what their different FFL license classifications are based on. More likely than not, you will be looking for an FFL type 01, 02, or maybe even a 09. The most common FFL type is 01, and this is probably the one you’re after. With this license, you can operate your business from your home. Also, as you will potentially have access to the same wholesale prices for your inventory as retail stores, but without the same high overhead costs, you should have a good profit margin per sale. Why take your FFL business online? The clear advantage of starting an online FFL business is the massive increase in potential customers you might get. If you’re about to get started, there are some challenges that come along the way in terms of card processing and payment gateways, but we’ll touch upon that soon. In addition to a broader audience and potential client pool, there are also a lot of costs you can minimize to a much greater extent than a retailer might be able to. Not to mention that the investment for getting your FFL is commonly no more than $200, with a $90 renewal after three years. While there is an ocean of tips and advice as to how to run a successful business of any kind, there are certain things you must make sure to keep in mind. FFL is a high-risk, tightly regulated, market. As such, legal and economical topics can be complex and challenging. It is important to find sound legal advice to make sure that you don’t risk your business and revenue. You can always contact us anytime if you are looking for tips or an e-commerce attorney, as we have some great recommendations based on multiple customer reviews. Vigilance and constant growth is always good advice to go by, especially so when you have a high profit/ low-cost business in a high-risk industry. We have also written a comprehensive article called online firearms sales 101; please feel free to check it out. For more information on how to make your online store perform successfully, read on. It is very important to take your time when determining the best way to sell online. For example, what software should you use? Currently, there are a lot of viable options in this arena. It is critical to be aware that most of the standardized, out of the box, processing options that come with the Web Design templates are rarely FFL friendly. That is not to say you can’t use these site builders; you need to be aware of their limitations and be willing to adapt to different payment processing options. However, there is one crucial thing you need to know if you are planning your FFL payment gateway through Shopify. The out of the box processing it offers is not automatically FFL friendly – their terms also restrict some firarms sales. In order for you to sell firearms online using Shopify, you need to plug in a high-risk payment gateway or alternatively get an Authorize.Net FFL friendly processing combo that is tailored to your business. As you can tell, there are many routes you can take to enable your online FFL sales. Optimizing that route, and enabling you as much as possible, is where we can offer our expertise. We make recommendations and offer advice on this all the time, so feel free to contact us anytime using the form above. The process is pretty painless, and the integration with Shopify or any one of dozens of shopping carts like WooCommerce is very easy. We offer this with no pressure or obligation to sign up for our services. We believe in gaining clients by building relationships and helping e-commerce retailers become more successful, so we are happy to help anyone trying to break into the “high-risk” e-commerce industry. Having a site capable of processing payments and having a profitable online store are two very different things. We want to help you achieve the latter, so please read this “6 secrets” article, also from Garrison Everest which can help you attract some more potential buyers. The article reports that 81% of all firearm purchases begin with a web search. What that tells us that if you have an FFL web-store, you want to rank high on the search engine’s results page (SERP). Therefore, you should not only be filling your website with inventory, but also providing useful content for potential buyers. This is a great way to add value to your customer’s buyer’s journey while improving your online ranking and traffic. Another encouraging piece of info is that firearm sales are still high. This makes it a profitable industry for those who go through the research and effort to become successful. Stay on top of your industry with these tips, and feel free to contact us with any FFL friendly payment gateway, e-commerce, or online fraud related questions.